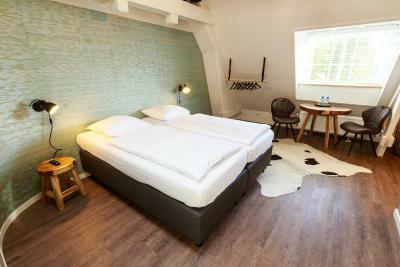 Lock in a great price for B&B Landgoed De Grote Beek – rated 8.6 by recent guests! Very clean, very friendly and helpful staff. Wi-Fi is good. Good coffee any time for free. Not far away from airport. Staff was so kind and helpful, as the rest of dutch people! Location was easy to find and had an amazing garden with birds and everything. 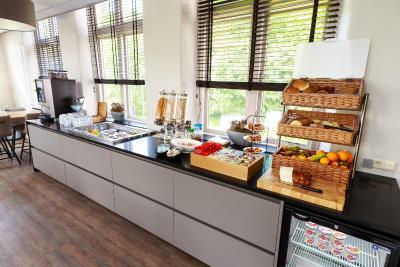 Breakfast was good, room was clean and definitely It was one of the best stays for me. My friend came to visit me and they were okay with that, as they should be. Thanks and see you soon Landgoed! Very nice setting in a green area right next to a forest, close to bus stop. Everything about the property and how it is maintained. Extremely helpful staff, great cozy place to retreat into for some peace and quiet. Access to shared kitchen and coffee/tea availability any time of the day is great. As other travelers have mentioned, they packed a doggy bag to take away for my early morning flight. 1. Nice modern and clean 2. Accommodaion of gluten free diet at breakfast. 3. Shower gel/shampoo by showers 4. Bathrobe - although needed due to shared showers. I liked the modern design of the room, especially the wood beams that added an interesting effect to the feeling in the sleeping space. It took a bit of getting used to the shared toilets and showers but they are kept very clean and very private. Appreciated the very comfortable bed and hot baguettes for breakfast! The staff is great and they were very accommodating. One of our best sellers in Eindhoven! 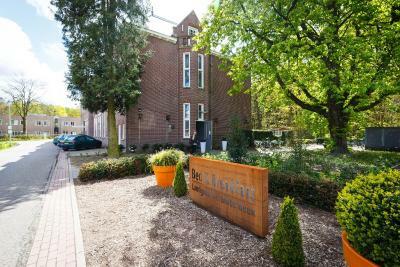 Featuring free WiFi throughout the property, B&B Landgoed De Grote Beek offers accommodations in Eindhoven, 3.1 mi from Van Abbemuseum. 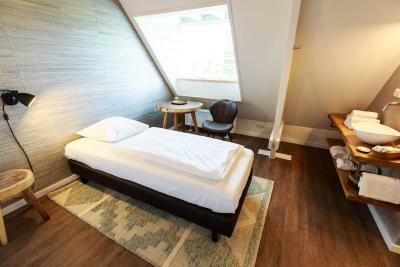 The B&B offers 24 renovated rooms. The rooms have a TV. In the bed and breakfast there are shared showers and toilets available. 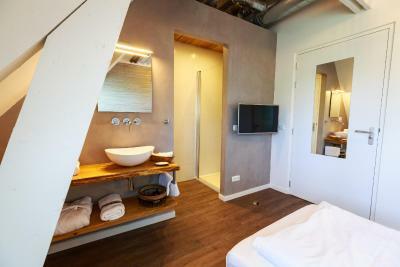 The luxury rooms are equipped with brand new private bathrooms.The B&B contains a spacious living room and kitchen. Free WiFi is available throughout the entire property. The B&B is set on a site for mental healthcare. The bed and breakfast also offers bicycle until 23:00. PSV - Philips Stadium is 2 mi from B&B Landgoed De Grote Beek, while the city center is located at a distance of 3.1 mi. The nearest airport is Eindhoven Airport, 4 mi from the property. 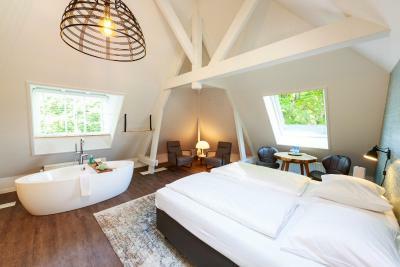 When would you like to stay at B&B Landgoed De Grote Beek? This single room features a private entrance, sink and bathrobe. Guest have access to a shared bathroom. This double room has a private entrance, sink and bathrobes. Guest have access to a shared bathroom. This family room features a private entrance, sink and bathrobes. Guest have access to a shared bathroom. This deluxe single room has a private entrance. The private bathroom features a shower and bathrobe. This deluxe double room has a private entrance. The private bathroom features a shower and bathrobes. This suite comes with a private entrance. The private bathroom features a shower, bath and bathrobes. Area Info – This neighborhood is a great choice for travelers interested in city walks, friendly locals and city trips – Check location Great location - show map Guests loved walking around the neighborhood! 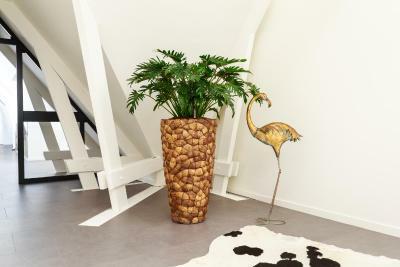 House Rules B&B Landgoed De Grote Beek takes special requests – add in the next step! ATM card B&amp;B Landgoed De Grote Beek accepts these cards and reserves the right to temporarily hold an amount prior to arrival. 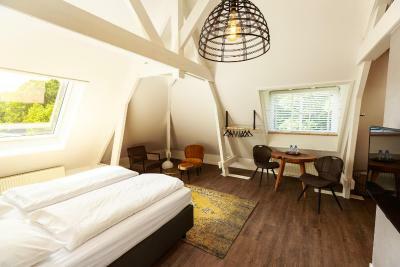 B&B Landgoed De Grote Beek accepts these cards and reserves the right to temporarily hold an amount prior to arrival. The B&B is set on a site for mental healthcare. For that reason, the use of alcohol and drugs is prohibited. Nothing we can think of disappointed us! A little bit far from downtown. You have to use bus #8 (2 times per hour). Very friendly people up there! Great breakfast and excellent location! The facilities were great, the garden spectacular and the most amazing staff I have ever encountered. 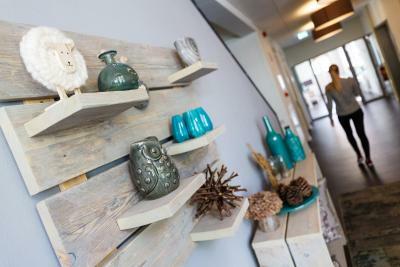 Great budget bnb 10 min from Eindhoven city center. The room, the beds, very good breakfast. Very clean. Wash basin in the room. Friendly staff. Location was inconvenient for going into the city and public transport is infrequent in the area. Comfortable, elegant rooms. Quiet location. Wonderful breakfast. The room was very clean and the staff was polite and friendly. New and very nice room. Pleasant, very quiet part of the city. - Location: The B&B is in a very quiet rehabilitation facility surrounded by plants. - Breakfast: breakfast had everything you can expect from a European breakfast, and they are of decent quality. - Cleanliness: spotless. - Staff: friendly staff answered my questions and offered help. - Proximity to Eindhoven Airport: if you are traveling from EIN airport, you can even walk there in about 45 min. with pavement for pedestrians. Praktisch. Good choice to omit Dutch early morning traffic jams.